Tired of the same old raisin bran? Do you have food ennui? 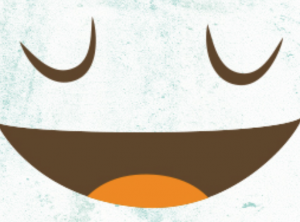 Will one more turkey sandwich drive you over the edge? Well, today’s a game changer. Experience “Monster Mash”, Yuki’s recipe for some pre-winter sustenance, a dish that gets rave reviews from those of you who need a little love and light in your food repertoire. 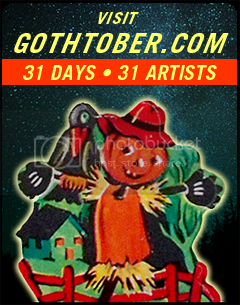 It’s DAY 24 on the Gothtober Countdown Calendar. DAY 7 on Gothtober is all about CANDY. There are people who give out toothbrushes to trick or treaters, and then there are the people in the world who are ALIVE. 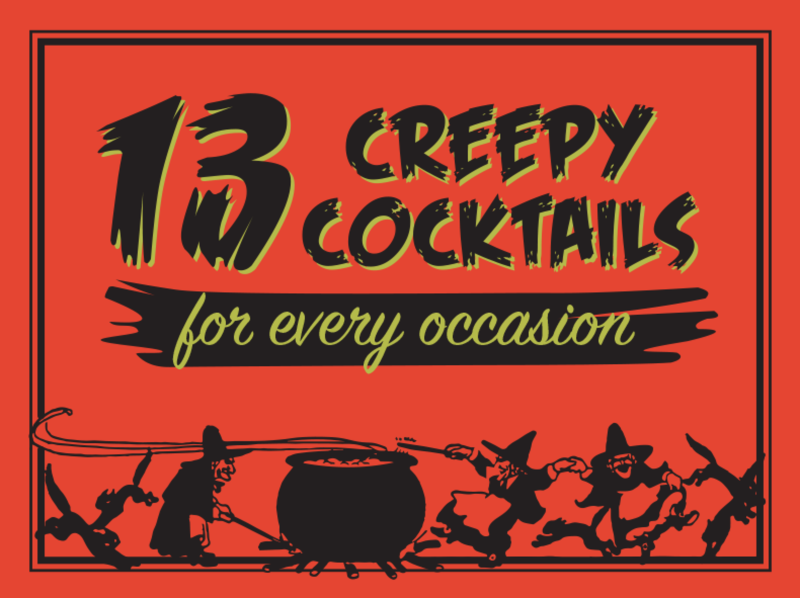 Halloween is not about restraint, or making sense, or paying attention to limits, or going on a diet. Halloween is about rotting your teeth. That’s why we believe this recipe for Peanut Brittle isn’t just a recipe, it’s a Public Service Announcement. Sure, you can buy peanut brittle and stuff your face and lay on the couch and moan and feel regret, but why do that when you can really fall down the rabbit hole and make your own? 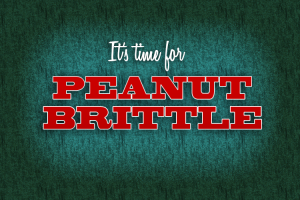 If you’re going to feel like you ate too much peanut brittle, make sure it was good peanut brittle. And make sure you did the work that it takes to make delicious, crunchy, melty, peanutty peanut brittle, because the work makes it taste better. Anything you have to stir for more than a half an hour deserves your attention and appreciation. We recommend that you make this recipe with a friend, because it’s fun to take turns stirring. And hey, it’s true, the dentist isn’t going to be thrilled with your peanut brittle consumption. But it’s Halloween. And it’s real sugar, real butter, real peanuts, and it’s home made. There is a difference, and no dentist can deny it. 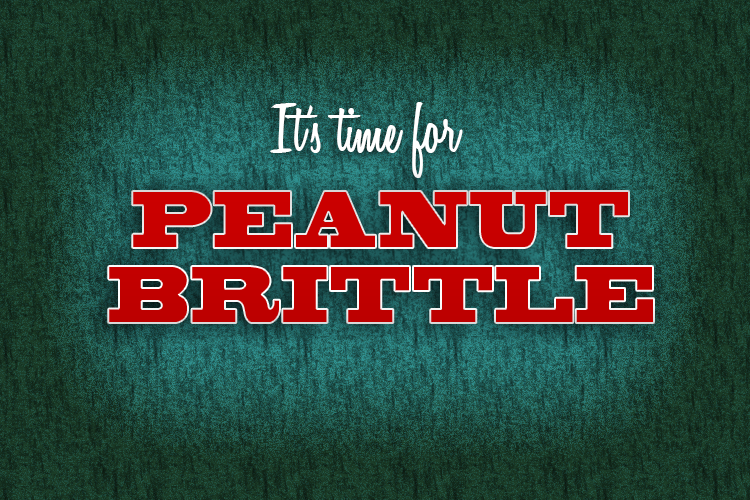 It’s time for Peanut Brittle. Vincent Price Spaghetti! Special Recipe! Food, Recipe, Treats Comments Off on Vincent Price Spaghetti! Special Recipe! 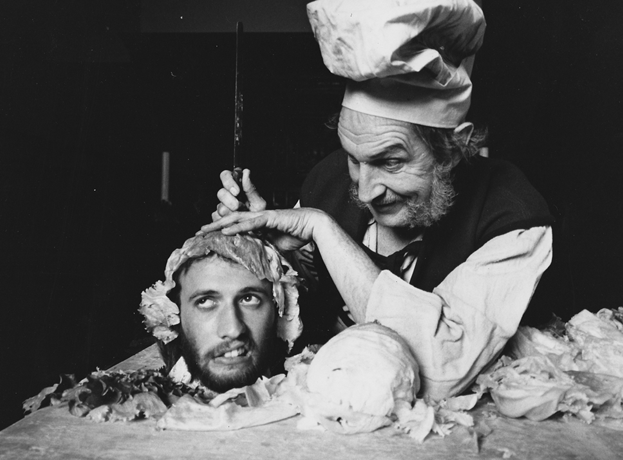 Vincent Price was really into art, and really into food, and he published a book with his wife many years ago called A Treasury of Great Recipes that I would stare at from time to time during my childhood. It sat in a prominent spot on the cookbook shelf in the family kitchen, and it was perhaps the first time I understood that an actor could have interests outside of being on stage or on screen. Mr. House of Wax put together a fine list of recipes with his wife, and it is a collector’s item today, available on Amazon in mint condition for about three hundred bucks. Published in 1965, this book with it’s padded faux leather copper exterior and gilt lettering doesn’t have fast recipes, it’s got recipes you slave over slowly with love for food. It’s also peppered throughout with beautiful pen and ink illustrations and harkens back to those globetrotting Pan Am days of travel and romance that Mary and Vincent Price were enjoying with true appreciation and wonder. A photo of Spaghetti alla Bolognese and a sketch from the book! I called Bill Parr (Dad), and asked him to pick one of his favorites from the book that might be an easy recipe for Gothtober readers, and so here you go, from the vault of Gothtober Dad’s recipe bookshelf is Vincent and Mary Price’s recipe for Spaghetti alla Bolognese. Kind of a great thing is that while it seems that Mary and Vincent were at Tre Scalini a long time ago, the restaurant opened in 1815 and is open for business even today! 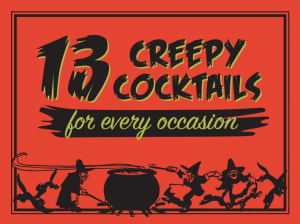 Just try to read this recipe without hearing Vincent Price’s voice. Bon Appétit! SAUCE: In a heavy skillet heat 2 tablespoons butter and 2 tablespoons olive oil. Add: 1 onion finely chopped and cook until soft. Add: 3 rashers lean bacon, cut into small pieces, 1 carrot, chopped, and one stalk celery, chopped. Sauté over medium heat until lightly browned. Add 1/2 pound beef, coarsely ground, and stir until meat is coated with fat. Add: 2 chicken livers, minced. Stir until meat browns evenly. Add 2 tablespoons tomato puree, 1/2 cup dry white wine, 1 cup beef stock, 1 bay leaf, and 1 strip lemon peel (thin yellow skin only). Season with: salt, freshly ground pepper, and 1 clove garlic, crushed. Tre Scalini has a sidewalk café just off the Piazza Navona. You can sit at a table outside and enjoy the view of Bernini’s fountains over an ice cream, or go indoors and enjoy the view of their sumptuous buffet over a dish of pasta. Only people who loved their pasta could have invented so many charming shapes for it. But the great classic dish remains spaghetti with savory meat sauce. SPAGHETTI: In a large pot pour: 3 quarts of water. Rub a little olive oil or butter around the sides of pot above water line. This will prevent water from boiling over when you cook the spaghetti. Add 1 tablespoon of salt and bring to a rapid boil. When water has been boiling briskly, take: 1 pound spaghetti and feed by handfuls into the boiling water. Dip one end of the spaghetti sticks into the water, and as they get soft let them coil into the pot. Never break them. Stir with a wooden spoon occasionally. If you are using packaged spaghetti, cook for about 12 minutes, or according to directions on package. It should be soft but firm when you bite it. (The Italians call this al dente, or “to the tooth.”) Homemade pasta will need less time to cook – only 5 to 7 minutes. Drain cooked spaghetti in a colander over a pan of boiling water and covering it with a towel wrung out in warm water. Place spaghetti on a warm platter and dot with: 4 tablespoons butter. Sprinkle with: 4 tablespoons freshly grated Parmesan cheese. Serve with meat sauce on the side, or in the center of the platter with the spaghetti around it. Pass a bowl of freshly grated Parmesan cheese with the platter.